This simple dining table and chair set will give your casual dining room a charming style that you will love. The smooth rectangular table top has rounded edges, above pretty turned legs. The traditional Windsor style chairs feature classic spindle backs, shapely wooden seats, and simple turned legs. Available in a Natural or lovely two tone Natural and White finish, this dining set will blend beautifully with your decor for a warm and inviting space that you will love. 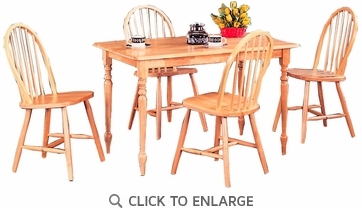 4127 Chair 4 18" 18" 36"
4347 Table 1 48" 30" 29"
Finish & Paint Options Natural wood finish.